The University of Nevada, Reno police services is taking a knee when it comes to potentially punishing an officer who wore a racist costume mocking Colin Kaepernick. 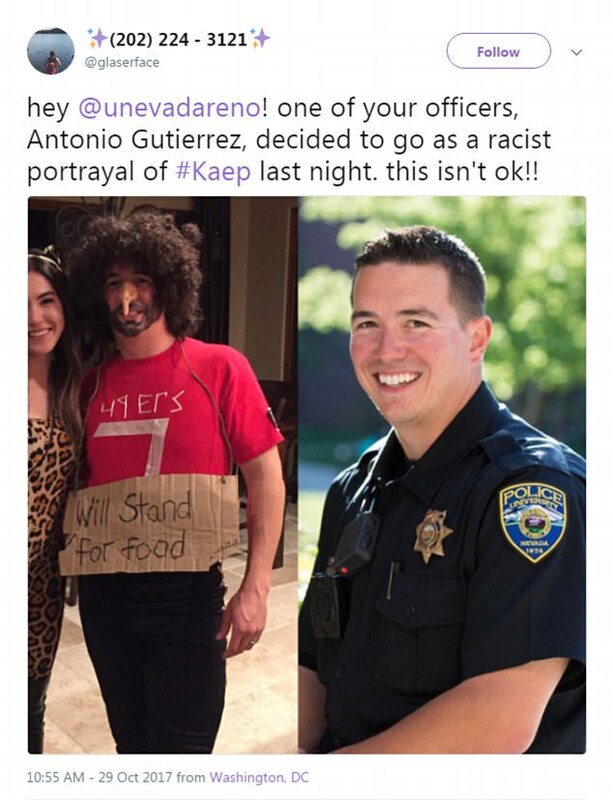 UNR Police Chief Adam Garcia apologized Sunday after an image depicting one of his officers wearing an inappropriate costume mocking Colin Kaepernick circulated on Twitter. The dual image shows a UNR police officer on the right and a photo of what appears to be the same man dressed in a wig, fake nose and painted beard on the left. The man is also wearing a red shirt with the words "49ers" and the number "7" taped on, as well as a sign that reads, "Will stand for food." 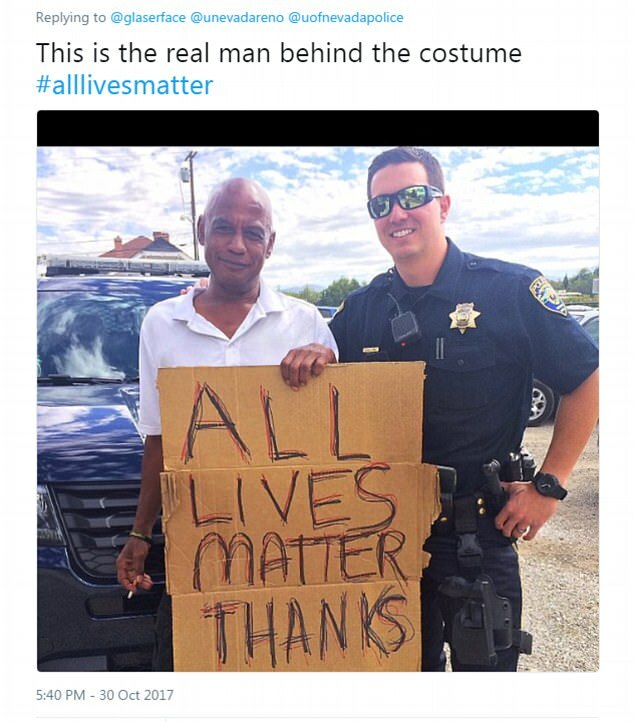 "For those who have seen the Halloween costume of one of our officers apparently mocking a citizen who has chosen to take advantage of his constitutional right to protest, I offer my sincere apologies," Garcia said in a statement. "Members of our profession are held to a higher standard and denigrating another - on or off duty - is insensitive for its lack of respect and lack of understanding on how others may negatively view their actions and may be impacted." The Twitter user who posted the image referred to the police officer as Antonio Gutierrez -- a fact that Garcia did not confirm nor deny in his statement. Attempts by the Daily News to reach Gutierrez for comment were unsuccessful. 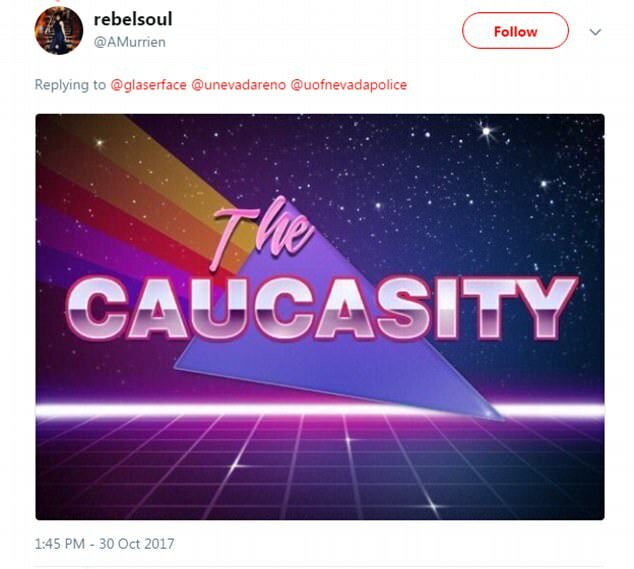 UNR spokeswoman Kerri Garcia told the Reno Gazette Journal despite the "insensitive" nature of the incident, the officer in question will not be punished. "As insensitive and inappropriate as this is, we have no policy that would dictate any disciplinary action," Kerri Garcia said. Kaepernick, who ignited a media firestorm for starting the national anthem protest movement as a member of the 49ers last season, graduated from the University of Nevada, Reno in 2010. The polarizing quarterback was a two-time Western Athletic Conference Offensive Player of the Year and threw for 10,098 yards and 82 touchdowns in four seasons. Kaepernick, who is active on social media, has not publicly commented on the controversial costume.